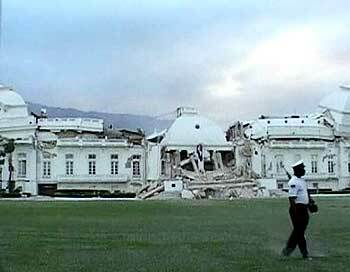 Thousands were feared killed when a major quake of 7.3-magnitude rocked the Caribbean nation of Haiti and damaged the presidential palace besides other government buildings in the country's capital Port-au-Prince, an incident termed as 'catastrophe of major proportions'. The devastating quake struck at about 15 km south-west of the capital at 4.53 pm local time and was followed by three aftershocks of 5.9, 5.5 and 5.1 magnitude, the United States Geological Survey said. 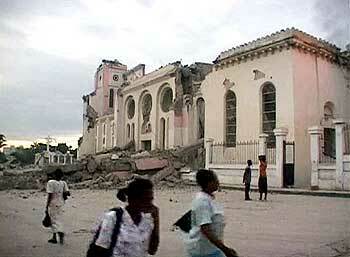 This is the worst earthquake to have struck Haiti in the last 200 years. 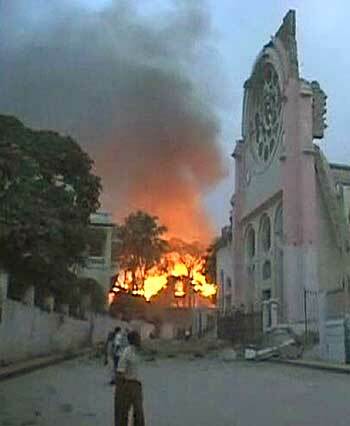 However, few details were available about the extent of the damage as the communication network collapsed completely. According to unofficial estimates, thousands of people may have been killed by the earthquake in the impoverished country. Most parts of the capital were plunged in darkness after the power connection failed in the aftermath of the quake. Eyewitnesses described the situation as 'total disaster and chaos' and said several bodies were lying on the 'roads and sidewalks'. Capital Port-au-Prince, one of the worst hit by the quake, was reportedly covered in a 'cloud of dust'. A hospital in Petionville reportedly collapsed during the quake, trapping hundreds of patients inside. The headquarters of the United Nations peacekeeping mission and the presidential palace were also severely damaged during the tremors. The Hotel Montana, popular with tourists, was reportedly flattened in the quake. Over 200 French tourists were staying in the hotel at the time of the earthquake, and no information is available about them. Haiti is the poorest country in the Western Hemisphere, with eighty per cent of its population living below the poverty line. Image: People walk along a street lined with buildings that were destroyed by the earthquake. Panic-stricken residents of Port-au-Prince and neighbouring districts rushed out of their home when the tremors struck, and watched in disbelief as their homes fell apart before them. Thousands of locals were stranded on the roads of the capital, covered in dust and clutching their near and dear ones, reported CNN. Due to the total breakdown in communication, journalists predicted that it would take at least two to three days to assess the extent of the damage in the Caribbean nation. UN officials are trying to find out how many casualties the UN Peacekeeping force in Haiti has suffered. The UN has 9,000 peacekeepers in the country which include over 7,000 soldiers and 2,000 policemen. There are 200 Indians living in Haiti including 60-100 who work for the UN mission. 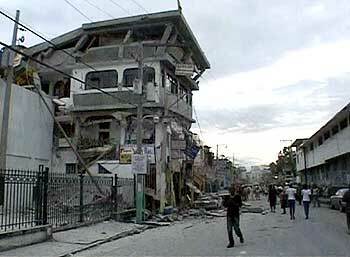 Image: A building destroyed by the earthquake. "We don't have any figures for the time being. But we know clearly it is a tragedy for Haiti, and a tragedy for the UN, and especially for the UN peacekeeping mission in Haiti," said Alain Le Roy, Under-Secretary-General for Peacekeeping Operations. Of the over 200 Indians, some 60-100 live and work in the country and are mostly associated with the UN peace mission. "We have not been able to establish contact with the Honourary Indian Consul General in Haiti, Marie Andrine," said the deputy Indian ambassador to Cuba. The Indian Embassy in Cuba also takes care of Indian affairs in Haiti. 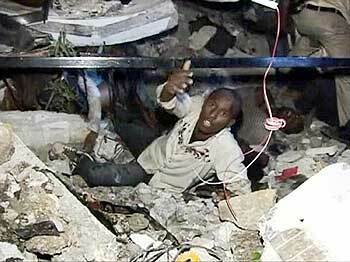 Meanwhile, Haiti's ambassador to the US Raymond Alcide Joseph termed the quake as a "catastrophe of major proportions". Image: A man calls for help while being trapped among the debris at the Port-au-Prince University. US President Barack Obama has offered immediate help and asked his officials to gear up for sending relief material to Haiti as soon as possible. "We are closely monitoring the situation and we stand ready to assist the people of Haiti," Obama said. "My thoughts and prayers go out to those who have been affected by this earthquake," he said in a statement. The Pacific Tsunami Warning centre, a US government agency, issued a tsunami warning for countries bordering the Caribbean sea -- Haiti, Cuba, the Bahamas, and the Dominican Republic. "We are still gathering information about this catastrophic earthquake, the point of impact, its effect on the people of Haiti. The US is offering our full assistance to Haiti and to others in the region. We will be providing both civilian and military disaster relief and humanitarian assistance. And our prayers are with the people who have suffered, their families, and their loved ones," US Secretary of State Hillary Clinton said in a statement at Honolulu in Hawaii. 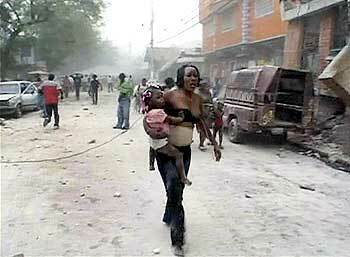 Image: A woman carries a child after an earthquake in Port-au-Prince.